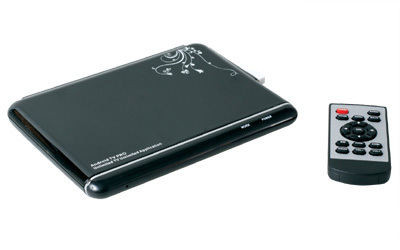 With more relieved visual display, This products brings multimedia experience different than limited screen tablet computer. Right now many emerging digital player device that shifts the existence of DVD players. For who are accustomed downloading digital content (music, photo, or video) would know this kind of tool. Well the latter gaining in popularity, as the development of systems based on Android gadgets, is the Set-Top-Box (STB) specially useful for presenting multimedia experience on a TV screen. This device more popularly known as the android tv box which now being circulated in various brands. Android TV Box design average similar to the first comes multimedia player. The design is compact so it does not require much space next to your TV. To connect to the TV channels are provided HDMI and also component (YPbPr). This second option is good option when you use TV does not yet provide HDMI connection. To connect with Internet two paths provided, via the LAN cable (RJ-45) or via Wi-Fi to make it more practical. Moreover, now connect via Wi-Fi is commonly used. Because its function similar to a computer tablet, Android TV Box control is assisted by a remote control provided. 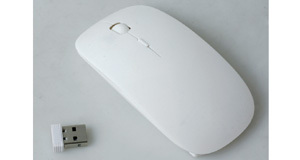 In addition, manufacturers also include a wireless mouse that are useful for controlling cursor on screen. Use of this mouse could be considered a substitute method on a computer touchscreen tablet. Unfortunately the system in Android TV Box does not support multitouch method so that image in screen can not zoomed / minimized. The device also does not provide a motion sensor (accelerometer) that sometimes required for certain applications. Even though size is quite slim, the device comes with a 900 MHz processor speed Amlogic, 512 MB RAM capacity, 2 GB storage and as a main component. Graphics chip was powered Mali-400MP that is quite powerful for its class. No wonder that the performance values ? ?can be displayed higher than the same set top box we’ve ever tried (see table). Some of HD game we tried was running smoothly although some appear to look too flat due to a resolution of 1240×690 pixels which is rather unusual. Android 2.3.4-based devices are also able to meet Internet activity (browsing and chat) or showing film of various formats. You want to get a tablet computing experience on a larger screen without mobile convenience are sure to appreciate Android TV Box existence. 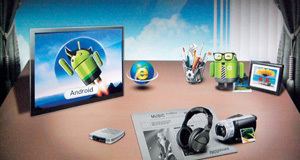 At least the Android platform computing activities can be obtained with a different impression. This is because opening Facebook, send e-mail, up to play the game certainly feels more “spacious” on the TV screen. In any such device is an attractive partner for TV at home. This device has a lot of I/O ports including audio channels for microphone and line connection to the TV component as well as HDMI channels. If the other Android devices come with a homescreen, this player displays more familiar initial interface through pictorial (iconic) menu for each activity. Because access to the remote control considered incomplete/uncomfortable, extra wireless mouse from the package very clearly to help users accessing Android system. Plus: Compact design; many I/O facilities; wireless mouse bonus; good performance; affordable prices. Minus: No specific facilities accelerometer and multitouch.